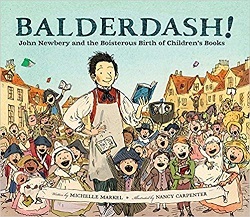 ﻿ Sonderbooks Review of Balderdash! Review posted October 5, 2018. Chronicle Books, 2017. 44 pages. Here’s a picture book biography of John Newbery (yes, that’s with one R), the publisher who began publishing books for children. The book is written with simple text and entertaining illustrations, in the style of the books John Newbery published. and scores of other rules. When John Newbery started publishing books for children, he began with A Little Pretty Pocket-Book and was the first bookseller to sell a book with an accompanying toy. He went on to publish more books, a magazine, and even a novel for children – the first one being The History of Goody Two-Shoes. Now, readers today will notice a strong moral. “Goody went from rags to riches without a fairy godmother. She did it through study, hard work, and kindness.” But the whole idea that children could learn from a story, rather than a sermon – that was revolutionary. The idea that reading might be fun? Thank John Newbery! Of course, John One-R Newbery is who the Newbery Medal was named after when the American Library Association decided to give an award “for the most distinguished contribution to American literature for children.” It’s because of John Newbery that the world got the idea there could be literature for children. This is mentioned in the note at the back. The main text is kept light and fun and geared for children.